Home > Inspirational > Will We Remember Our Life on Earth When in Heaven? Will We Remember Our Life on Earth When in Heaven? 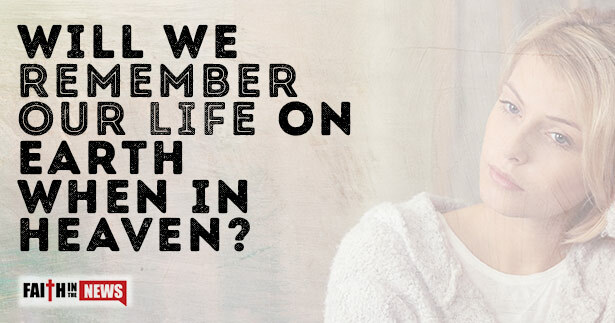 Will we remember our former life on Earth when we are in heaven? When a young man came up to Jesus and asked Him, “Teacher, what good deed must I do to have eternal life” (Matthew 19:16), he obviously didn’t realize it’s not about what we do to be saved but through Whom we are saved; and that is Jesus Christ, of course (Acts 4:12). So Jesus runs the young man through the commandments to show him he can’t save himself by obeying the law. The law of God simply shows us what sin is (Romans 7:7), which is transgression of the law (1 John 3:4). The young man boasts, “All these I have kept. What do I still lack” (Matthew 19:20)? But this can’t be true. Who has ever kept the commandments of God? No one, that’s who. Besides, none are good, not even one (Romans 3:10-12). This young man didn’t get what Jesus was trying to tell him. Jesus saw this man’s heart and told him, “’If you would be perfect, go, sell what you possess and give to the poor, and you will have treasure in heaven; and come, follow me.’ When the young man heard this he went away sorrowful, for he had great possessions” (Matthew 19:25-26). Jesus’ point was that “only with difficulty will a rich person enter the kingdom of heaven” (Matthew 19:23). This was when the Apostle Peter said, “’See, we have left everything and followed you. What then will we have?’ Jesus said to them, ‘Truly, I say to you, in the new world, when the Son of Man will sit on his glorious throne, you who have followed me will also sit on twelve thrones, judging the twelve tribes of Israel. And everyone who has left houses or brothers or sisters or father or mother or children or lands, for my name’s sake, will receive a hundredfold and will inherit eternal life. But many who are first will be last, and the last first’” (Matthew 19:27-30). There is a hint here that God will remember what we do for Him while here on Earth, meaning if God remembers our works for Him on Earth, we’ll remember our former life and our works while here on Earth after we receive our rewards at Jesus’ return. When believers finally receive their glorified bodies, will they remember the former things? Some use Isaiah 65:17 as proof that we won’t remember a thing. This verse says, “For behold, I create new heavens and a new earth, and the former things shall not be remembered or come into mind.” But what is the true meaning of this verse? Does this mean we won’t remember our life here on Earth? I don’t think what Isaiah is saying is that once the Kingdom of God is established, all of the former things like pain, suffering, hunger, and thirst will be removed from Israel’s memory banks (Isaiah 65:14-15) but rather what the kingdom will be like when Christ reigns over the new Earth (Isaiah 65:18-25). Isaiah 65 is a glimpse into the kingdom of God, not a wiping away of all our former memories on Earth. This is similar to Revelation 21:4 where it says that God “will wipe away every tear from their eyes, and death shall be no more, neither shall there be mourning, nor crying, nor pain anymore, for the former things have passed away.” There must be remembrance of our former life on Earth in order to say that these “former things have passed away.” The former things are those things we do here on Earth and the suffering Christians have endured. It makes no sense to have all these things permanently removed if there is no memory of them. In trying to comfort the persecuted church, the Apostle John encourages them (and us) by writing, “Beloved, we are now God’s children and what we will be has not yet appeared; but we know that when he appears we shall be like him, because we shall see him as he is” (1 John 3:2). In speaking of the coming kingdom, the Apostle Paul wrote, “For now we see in a mirror dimly, but then face to face. Now I know in part; then I shall know fully, even as I have been fully known” (1 Corinthians 13:12). Why would Paul write that we shall fully know then, “even as I have been fully known,” unless there was something more to know in the kingdom compared to life here on Earth? On the Mount of Transfiguration (Matthew 17:1-13), Jesus spoke with Elijah and Moses; but Peter, James, and John already knew who these men were, and they knew Who Jesus was, pointing out that there will be recognition of the past in the future. The disciples somehow knew who these men were, and they knew Who Jesus was. Obviously, we’ll remember our former lives, just as these two men talked with Jesus, possibly about the coming kingdom. The story of the rich man and Lazarus shows that there will be memories of the past (Luke 16:19-31). So when the Apostle Paul wrote “that the sufferings of this present time are not worth comparing with the glory that is to be revealed to us” (Romans 8:18), it seems to indicate that we will remember our present sufferings in the kingdom of God and that these sufferings can’t even compare with the glory of that kingdom and the glory that’s coming for us. We will see it as nothing in comparison to the eternal glory that believers will experience in the new heavens and the new Earth (Revelation 21:2). That’s what I look forward to. What about you? Can you imagine what that will be like? I can’t even grasp it right now, but someday we who have trusted in Christ will not have to imagine it any longer. It will be real, and we can look back at our former lives and see that it’s abundantly more than worth it (Romans 8:18).